If we classified the Russian fairy tales according to the plot, we would divide them into 3 main groups: animal tales, animal-human tales & human-spirit tales. The first group represents a set of rather simple stories commonly known as “for kids”. The second & the third ones are more complicated & usually have a deep, profound sense, so they are for those who are older. Unlike the modern trend telling foreigners that Russia is the place where bears with balalaikas wander, the bear is not a common animal in our folklore. Certainly, there are stories about them, (mostly belonging to the second group), – but rather few. 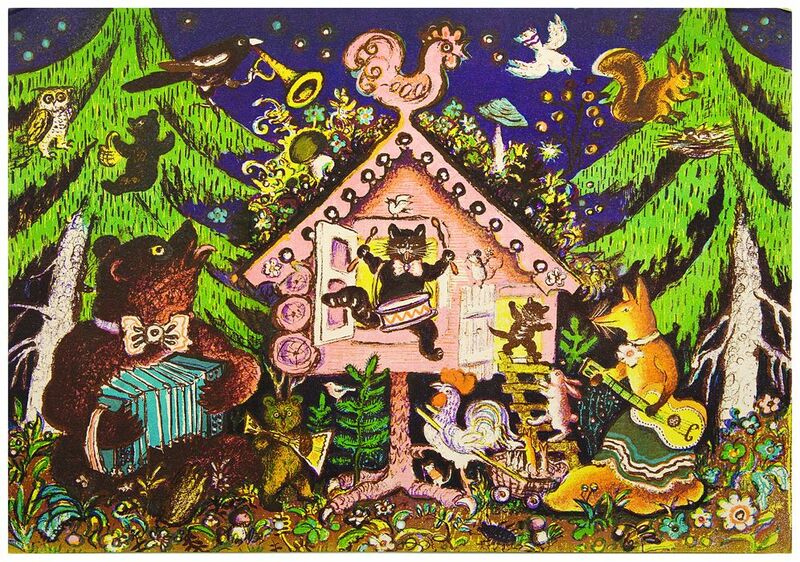 The most popular animals in the Russian fairy-tales are Fox, Wolf, Hare, then Bear and Rooster or other birds. Fox symbolizes slyness & too often wisdom. Its behaviour has something in common with the famous le Roman de Renart veiled with the Slavic spirit. Wolf represents simplicity or cowardice & he often is punished for his friend Fox‘s doing, but never anger or violence. It is very likely that originally this character was a dog. Its manner of behaviour points to that. Hare is an example of courage, creativity & helplessness. He usually suffers from Fox & Wolf’s crafty designs. Bear is stupid & ignorant. He always gets into a pretty mess due to his reluctance to think or to learn. Rooster is a symbol of justice, but he is a rather rare character in our folklore. I wonder why we have no horse, pig or cow stories though. Maybe because our Slavic ancestors used to live in the forests & they did not regard domestic animals as ones deserved to be mentioned in folk-tales. This entry was posted in culture, fantasy, folklore, fun, History, Life, Lifestyle, nature, news, Uncategorized and tagged Afanasiev A.N., animal tales, civilization, cultura, culture, favole russe, fiabe animalistiche, folklore, history, life, lifestyle, literature, nature, Russian tales, society, XXI century. Bookmark the permalink. I think you hit the nail on the head with the idea that domesticated animals were not included in folklore. Russia used the bear as a symbol, Given what you said about the bear I wonder why? That’s a good question, dear John. Thanks!The modern sources tell that the bear has always been an ambiguous character in our folklore. However they were Eastern countries that began using this animal as a synonim of Russia. The modern Russian policy uses its negative sense: the bear is strong, agressive, capable to kill anyone…but yet silly 🙂 Interesting approach, isn’t it? It is interesting that domestic animals are not featured in Russian fairy stories. There are many of ours that do feature them (English I mean). Yes, dear Robbie! This fact puzzles me very much. Besides domestic animals are closer to a human life, so they should play a part in tales. Credo tu abbia ragione sugli animali domestici. Grazie, cara Fulvialuna! E un caso molto strano davvero! Really interesting. I suspect poor bear has been exploitation by current trends. However, I find it interesting that animal only stories are for kids only. Unfortunately my novel is animal only but I don’t thinks it’s just for kids. So finding a publisher could be difficult. Domestic animals feature in Grimms Tales e.g. The Town Musicians of Bremen. They kind of get their own back. Thinking of the Panchatantra, perhaps this was one of the earliest uses of animals to tell moral and spiritual tales. I love your illustration. Thanks for your profound comment, my dear friend. Oh, well. mythology joints all the cultures. Thanks for Panchatantra, I have not heard of it. Thanks for the comment, my dear friend!